Don’t leave college now even though this is the time of year when many college students decide to drop out. This especially common for first year students. For some who are away from home it is because they are homesick. For some they have found that college is harder than they expected. For some of those who are struggling academically a drop in grades may threaten financial aid or scholarships. Whatever the cause, don’t leave college now! If you are homesick, students often find that a few weeks at home under the watchful eye of mom and dad as opposed to the freedom of campus life is all they need to realize that campus life is not so bad. The friends from high school, like you, have made new friends and found new interests and so the old closeness may not be as you imagined it would be. Don’t leave college now. Home is not where you really want to be again. Academic issues may be more salvageable than you realize. The term is not over yet. You can talk to professors about how to ace the final exam or paper or you can negotiate an incomplete. It is likely too late now to drop classes that look headed for disaster, but see if you can mitigate the damage. Seek out a tutor or head to the writing center. If you had actually done these things earlier (like they told you to at orientation when you were either not listening or were assuming you could handle it) you might not be in a pickle now. The main thing is now to come clean to your professor, adviser or dean and see what can be done. Don’t leave college and go back home—especially if you messed up. Schools are used to students having this reality check in the first semester and then getting it together later. It does not mean that you can’t get into a good graduate school later. It may however tell you that the field you thought you wanted may not be your cup of tea after all. Whatever you do don’t leave college now. Talk to your adviser and the others there to serve you in the career or pre-med/pre-law offices to be sure you are on the right path. Dropping in and out can cost you in the long term. If you think of transferring then you need to be sure that credits from one school will transfer to another so you do not waste money retaking requirements. Don’t leave college now to go to work because you will be postponing the higher earnings that a college degree can provide. Whatever you do – don’t leave college now – do not just walk away. If you are thinking you might want to leave college – talk to someone and do it officially. You may be able to take a leave of absence if there is a health or family crisis. In any event the registrar has to know that you have dropped out. Otherwise you will wind up with bills for classes you did not complete and for which you may get an F. That will damage your GPA and leave you in debt to the school. If you owe them money the school will not release your transcripts to other schools should you want to transfer. You may lose your financial aid if your GPA drops as the result of those Fs. Walking away is always a disaster. It will be better if you don’t leave college now. Dr. Cantarella is the author of I CAN Finish College: The Overcome Any Obstacle and Get Your Degree Guide and a consultant on higher education, access and success. 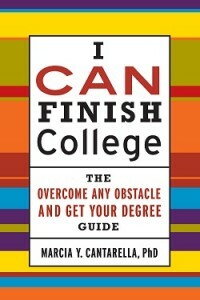 See Chapter 9 of I CAN Finish College and contact Dr. Cantarella at mycantarella@icanfinishcollege.com. If you are in the process of making the big decision on whether to leave college or not – don’t leave college!